The frequency of attacks by suicide bombers in Israel seems to be slowing, with many Israelis saying the reason is obvious - the barrier separating the West Bank from Israel is keeping out the suicide bombers. One of the places benefiting from this is the Israeli seaside city of Netanya. Svid Sacks, from Netanya's city council, says: "In 2001, we had about six attacks here in Netanya. "In 2002, we had four attacks in Netanya. 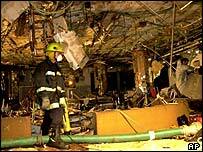 In 2003, we had one attack in Netanya and in 2004 we had no suicide or no bomb in Netanya." For him, these figures mean something very clear: Israel's barrier is working. He and his colleagues have watched as the barrier has been built and suicide attacks in their city have stopped. Mr Sacks said the barrier was a very positive thing. But he added: "It changes the Palestinians' life and I'm terribly sorry about it because they've got to lose much more than we've got to lose." The central promenade here on the coast in Netanya used to be a pretty terrifying place for most Israelis. This is the place that Palestinian suicide bombers often tried and succeeded in attacking. But now Israel's built its barrier and this central promenade has come back to life. There are dozens of cafes all around me with plenty of people sitting outside and enjoying the sun. What you really notice is that there are very few security guards around and that there are no fences stopping you from getting into the cafes. In Jerusalem at the moment, when you try to go to an outdoor cafe, you have got to get past a fence, past plenty of security guards, having your bags checked and so on. But here everything is open and it wasn't like this before the barrier was built. The busy tables are a pleasant sight for a smiling man called Maurice. He's French-Israeli and his cafe, La Creperie, is doing much better than it used to. "There is a big difference. People feel much safer, people are going out much more these days and it's all thanks to the barrier," he says. A British tourist from Reading sitting happily at Maurice's cafe also thinks the security is very good. "I was here in 2000 and 2001 - there has been a noticeable drop in bombings which is obviously brilliant." And it is not just coffee drinkers in the sun who feel much safer nowadays. The common view in Netanya is that everyone is better off because of the barrier and people are coming back. Over the summer hotels were fully booked. Carol Shaw, who lives in Netanya and works as an estate agent, says the lack of any recent bombing gave her a nice relaxed feeling. "I can walk around freely without looking at everybody that's passing me to see if he's an Arab or not an Arab, he's got explosives underneath his clothes or not." From the edges of Netanya, you can look out and see the West Bank hills on the horizon. 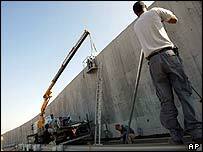 But you can't make out the fences and the walls that Israel has built on the ground. And in this city there's no great debate about the barrier's legality or about the confiscation of Palestinian land and the encirclement of nearby Palestinian towns. For Israelis here the equation is simple: the barrier has gone up and life has got better.